Daisy full blood Great Pyrenees and Ranger full blood Australian Shepherd. 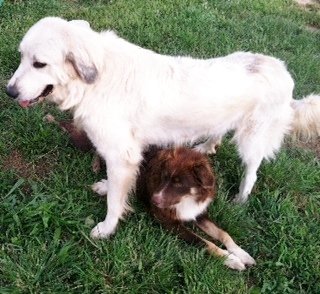 We sold our male LGD, but Daisy has found love with our Aussie Ranger! :) If she is indeed bred, she will be due around Halloween 2013! These will be AWESOME farm pups, both Daisy and Ranger are perfect pets and are so good with the other animals, so be looking for updates!